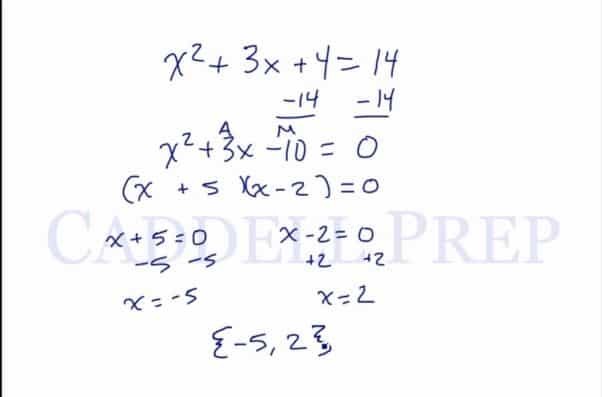 In this video, we are going to look at solving equations by factoring.To solve equations by factoring, we must make sure that the quadratic is set equal to 0. Let’s go over how to solve equations by factoring. The first thing to note here is that we have a quadratic and it’s equal to zero. So we have to make sure that the right side is zero. Draw two parenthesis and write on each. Then find two numbers that will add up to and when multiplied will be equal to . When can two numbers when multiplied be equal to zero? One of them has to be zero. Because of zero product property. So we have to come up with one of these terms be zero. Either of the two should be zero. We usually use the brackets not the parenthesis. Draw two parenthesis and in each parenthesis. Then think of two numbers that when you add up will equal and when multiplied will equal . Notice that the right side is not zero. So we have to make it zero. Now we can factor this out.